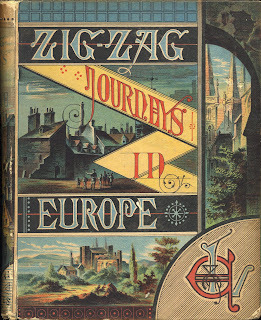 I think the preeminent travelogue series of the 19th century was the Zig Zag Series. The seventeen books of he series sold hundreds of thousands of copies. it made author Hezekiah Butterworth a millionaire and boosted the fortunes of the publishing house of Estes and Lauriat. The story behind the series is somewhat interesting. Butterworth (1839-1905) was an assistant editor with the Youth's Companion as well as a successful author when he was approached by Dana Estes of Estes and Lauriat. 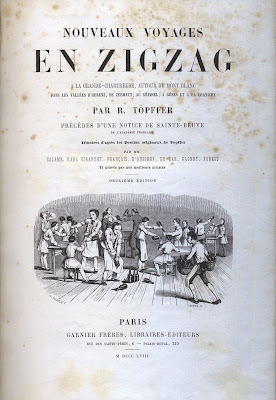 Estes showed Butterworth books written by Rodolphe Topffer Voyages en Zig-Zag (1843) and Nouveaux Voyages en Zig-Zag (1853). These books chronicled the adventures of a school teacher and his students. The Zig Zag name came from the zig zag nature of their travels. 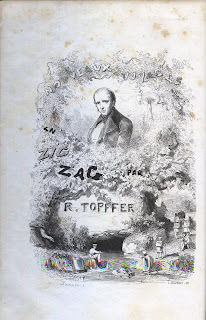 The Topffer books are elegant large books with gold gilt edged pages and numerous very well done illustrations. According to reviews the places described are accurate. Of course, since my copy is in French I haven't a clue about what Topffer is saying. 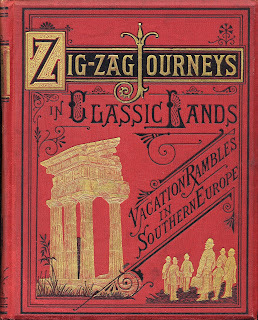 After Butterworth saw the books, he decided to go forward and cranked out 17 volumes of the Zig Zag Series between 1880 and 1896. (More about Butterworth and his books in the future.) The ZigZag books of Butterworth are certainly not of the same quality but they were indeed big sellers.